Just because you are following the Dukan Diet doesn’t mean that you can’t enjoy a fancy meal for a special occasion. 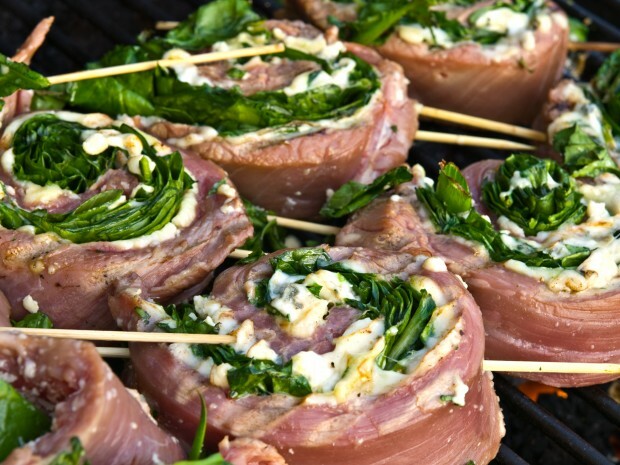 These Italian Flank Steak pinwheels are the perfect choice combining lean flank steak, veggies, and cheese for a delicious meal. They can be cooked on a grill or in a pan. Rub one side of the steak with garlic clove. Layer the spinach, basil, and sundried tomatoes evenly across the steak, leaving 1 inch around edges. Top with cheese. Start at one edge and roll up tightly. Brush the outside of the steak with oil. Option 1: Cut the steak into 8 portions and grill or pan sear each for 3-4 minutes per side. Option 2: Grill the entire rolled steak whole. It will take about 15-20 minutes for medium rare and you will need to flip it throughout to prevent burning. Let rest, tented in foil, for ten minutes before slicing and serving.